Notice of some new dinosaurian reptiles from the Jurassic Formation. American Journal of Science 14: 514-516. 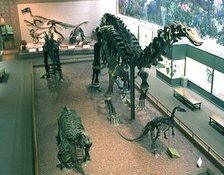 Why Brontosaurus is called Apatosaurus is explained HERE.